Porch Outfitters is among the leading sunroom builders serving Savannah, Georgia, and the surrounding areas. Our products are designed to be extensions to your home that come with the added benefit of providing a completely light-filled space and stunning, full views of the outdoors. To ensure our customers receive the best value for their investment in a sunroom, we only install products from the industry-leading manufacturer TEMO. Numerous innovative features make TEMO sunrooms the clear choice for homeowners who want a luxurious yet affordable outdoor living space. These enclosures are built with exceptionally durable extruded aluminum with TEMKOR surfacing to ensure a lifetime of structural stability and beauty. And, they are built with thermal wall and roofing systems. Not only will your sunroom remain comfortable throughout the year, you’ll be able to use the space as you see fit. Turn it into a yoga studio, home office, or simply a place to gather with friends and family. TEMO sunrooms also come in a wide variety of styles, making it easy for you to select an option that matches your home’s design as well as your personal tastes. Choose from elegant studio, dramatic cathedral, or sun-soaked solarium styles, among others. What’s more, you can have complete confidence that your investment in a sunroom is completely protected. Not only are these exceptional outdoor living systems backed by a lifetime warranty, Porch Outfitters matches this with our own lifetime workmanship warranty. 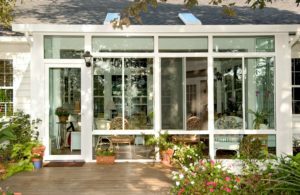 Contact us today to begin the process of installing a beautiful sunroom at your home in Savannah, GA.